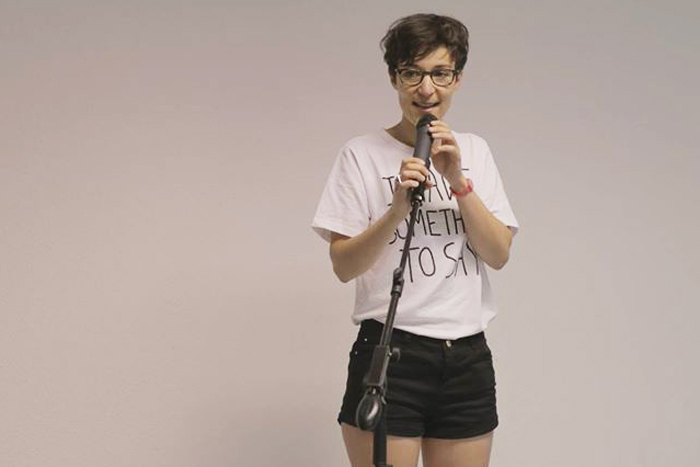 20 minutes, 12 t-shirts, a mic and speakers. 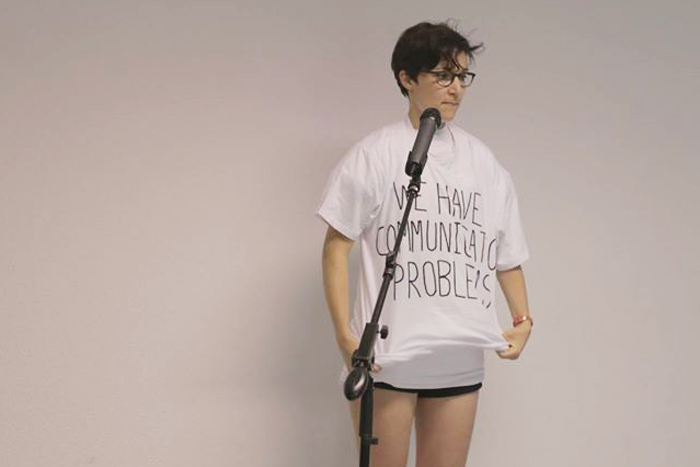 This performance came out of a piece of writing started during the residency program of the Dutch Art Institute in Marfa,Texas around issues of communication and the means of individual and collective addresses. How to say something ? 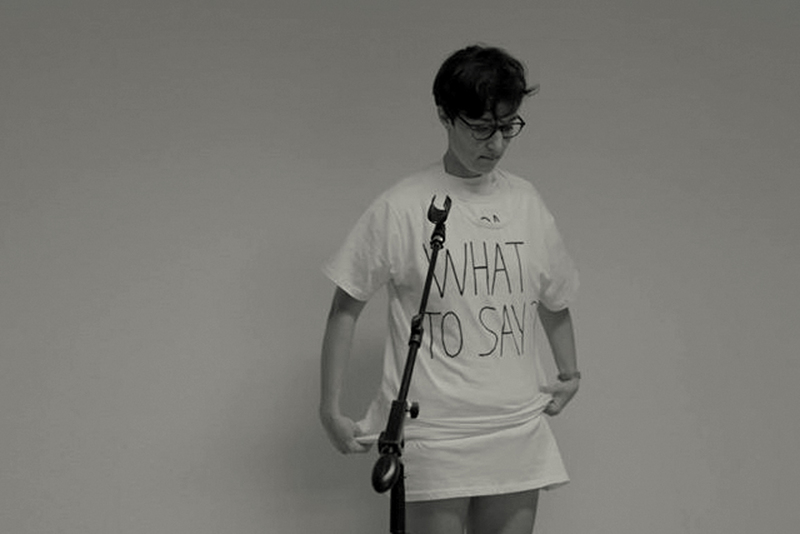 is an attempt to share the intimate, engaging and poetical process of “voicing”. It is a translation exercise from writing to speech ; from mental representations to physical presence. How to say something ? 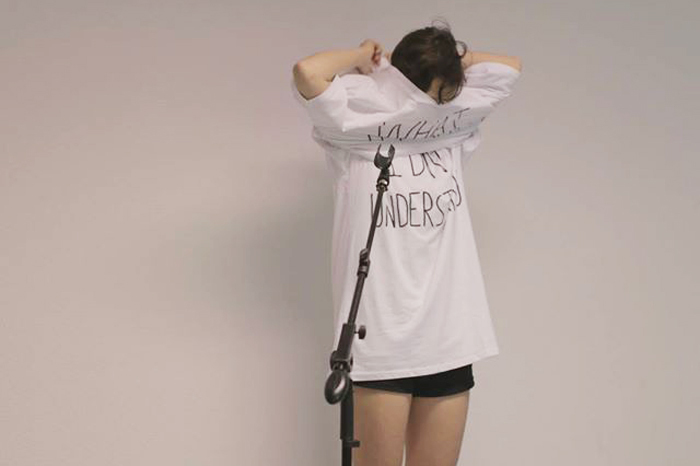 is composed from a letter read and an interactive discourse between a theoretical text about communication and basic short sentences associated with misunderstandings, written on t-shirts. 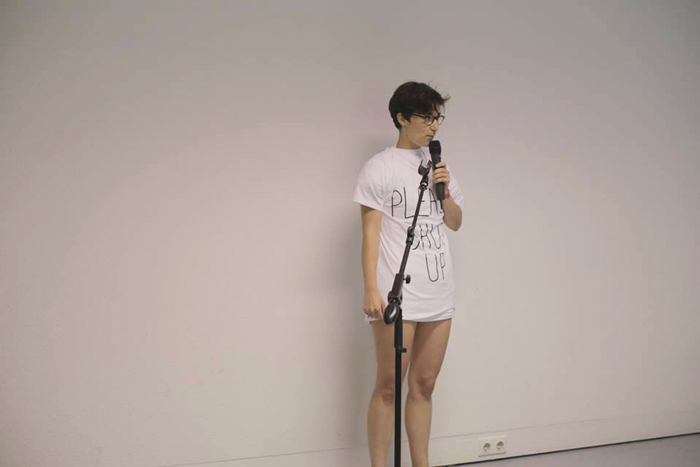 While the protagonist is explaining her speech, a counter-discourse happens on the t-shirts layered on top of each other, one after another. “ What is the invention of a language ? And what does it make us able to do ? The movement of Los indignados had this slogan « We have a vote but we don’t have a voice ». The voice is the first form of expression, the incarnation of a presence, a means to get out of oneself. Without it, we can’t discuss, cry, shout, read. Los indignados denounce a lack of listening, but beyond that they denounce the inability to give substance to a language. To Say : « we don’t have a voice » is to blame democratic institutions, but first of all, it’s a confession of powerlessness. An abundance of discourse and rhetoric, and too many communication devices make us suspicious and incredulous with language. Too attached to the effectiveness of our instruments, do we not forget that language is an uncertain tool, fallible, precisely because it is irrational.